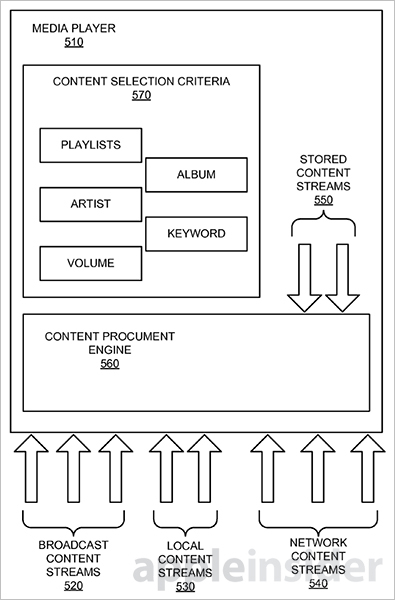 The U.S. Patent and Trademark Office has awarded a new patent to Apple which according to AppleInsider, analyzes on-board, broadcast or streamed media content to create a custom tailored playlist for an optimal user experience. The patent covers radio broadcasts, television broadcasts, Internet audio and video streams, satellite radio and more. The patent titled “Auto-station tuning” allows automatic switching between a variety of media sources based on user preferences. 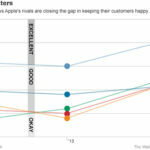 Apple describes it as a system that can analyze data from multiple media streams to determine what is currently playing and more importantly, what will be played next. Using this information, a device can then intelligently switch stations or media streams, based on parameters defined by the user. “For example, a user may tell the device to tune to a different FM radio station when an advertisement is detected. In other embodiments, a given configuration may change the stream from FM output to on-board content if user specifications are not met. While it is unclear if Apple will introduce a feature based on its latest patent in the near future, the invention however would be a pretty good fit for iTunes Radio and purchased iTunes content.